I've been using this unit Pioneer DEH-6950IB for 1 year+. 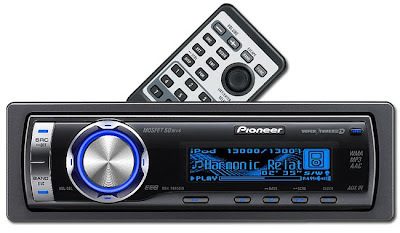 I was using a normal Pioneer CD player before(forgot about the model), and there are some advantages with this unit. First thing I would comment is it provides me with 7-band graphic analyzer, which as far as possible trying to help to tune the music to suit the listener. My previous unit only provide me with low, mid and high. It comes with 5 preset EQ ("SUPER BASS", "POWERFUL", "NATURAL", "VOCAL", "CUSTOM", and "FLAT"), and 2 custom EQ. Even better, it comes with low and high pass filter which helps to further enhance the component speakers. It helps by cutting down the lower frequency (mainly its the bass) from coming out from the front component,which may distort the quality of the sound. Furthermore, the deep blue OEL (Organic Electroluminescent) display features incredible brightness, clear readability, wide-angle viewing and full-motion 3D graphics. Because OEL creates its own electroluminescent light, its brightness is resistant to washing out in sunlight. Adjustable Loudness: You can select "Low", "Mid" or "High" for different levels of loudness compensation. Rear Channel Output: You can choose to use the rear channel speaker output for full-range speakers or subwoofers. If you select "subwoofer", you can connect a 4-ohm subwoofer directly to each rear speaker lead without using an external amplifier. I bought this player for USD180++. However, this player does not provide time alignment functions which allows you to adjust the time precisely when the music reach the listener(basically it is the driver seat). For the price of it this is a very good unit, and if you need a 13-band graphic analyzer, maybe you can consider unit like Pioneer DEHP-960MP,or some Alpine CD player. Overall, I would rate this player a score of 7/10, a pretty good car audio player/system. Comments are welcome.